Reached by driving 12.7 miles down the Notom-Bullfrog Road, Sheets Gulch is one of the easier Waterpocket Fold canyons to explore, as unlike others such as Burro Wash or Five Mile Wash there are no big dryfalls or chokestones, only a few minor drop-offs and shallow pools, and a recognized hiking route leads all the way through the canyon (a distance of 9 miles) to an alternative trailhead on the west side of Capitol Reef, accessed by a 4WD track starting from the end of the national park scenic drive at Capitol Gorge. 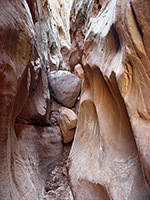 The narrows of Sheets Gulch are not as dramatic as some of the other nearby canyons, however, being neither very deep nor very extensive, but there are plenty of pretty, enclosed passages through finely-textured Navajo sandstone, colored in rich shades of red and orange. 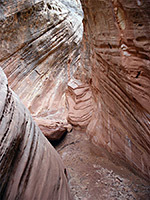 The most confined section extends about half a mile; upstream the gorge widens to allow large Douglas fir trees to grow on sandbanks around the streambed, making a striking contrast to the huge cliffs above, which are now white or pale orange in color, becoming reddish again further west, as the Navajo sandstone is replaced by the Wingate layer. The hike to this point is 4.7 miles, and as there are few obstructions in the narrows, the round trip takes just three hours or so. 15 views of Sheets Gulch; gallery, slideshow. Topographic map of Sheets Gulch. The signed parking area for the Sheets Gulch hike is on the west side of the Notom-Bullfrog Road a short distance north of the dry wash leading from the canyon, though as with others along the road, 4WD vehicles can drive up the sandy streambed a way, until the surface becomes too rocky. 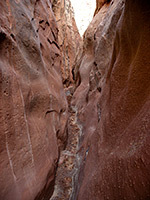 The wash has several wide bends between long flat stretches, with two tributaries, the first joining on the north side after a mile (leading eventually to another deep and enclosed canyon, after one blocking dryfall), followed soon after by a smaller one to the south. Low cliffs gradually rise up at either side of the main drainage but the first narrows in the Navajo sandstone are not reached until 40 minutes walking (2 miles) - these are shallow but quite tight, cutting through dark red rocks and containing a few chokestones, plus muddy pools after recent rainfall. These passageways are followed by a deeper, vertical-walled gorge that is not quite as narrow, and then by a more open stretch. Next is another slot, V-shaped in cross-section so narrow only at the base, and also not extending very far. Beyond this the canyon becomes very deep and has a few more short slot sections, but no significant obstacles, and so provides an easy walk right through the center of the reef, to the point where the gorge widens and the Douglas fir trees start to appear. 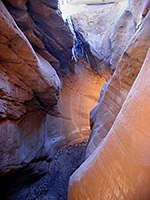 There is only one major side canyon, joining on the south side above a 20 foot pour off, 3.1 miles from the trailhead. Other features of the gorge include a graceful natural arch on the north side just before the side canyon, many small pieces of petrified wood along the streambed, and a good variety of wildflowers.